You learned a lot from baby #1-especially not to pay more for diapers when you don't have to. So now, you don't trust something because it costs more, you trust what works. 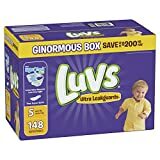 Luvs diapers protect baby from leaks at the low price you're looking for-complete with a money-back guarantee. That's because Luvs knows that between laundry, play dates, snack times, and nap times, you don't have time for leaks. Luckily, Luvs has Night Lock Plus to lock away wetness, even overnight. Luvs diapers also have large, refastenable stretch tabs and a wide fastening area to help make diaper changing time easier too. They're also super soft with a Leak guard core, to help keep baby dry and comfortable. You value your time, and so do we. Get a better value in diapers when you Live, Learn, & Get Luvs. Available in sizes NB, 1, 2, 3, 4, 5, and 6. If you're not completely satisfied, please send the original receipt and UPC to us within 45 days of purchase for a full product refund via prepaid card. Limited to one redemption per household or name. Child’s weight- 27+ pounds.